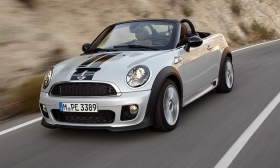 The Roadster will come in three different variants, including the Cooper, Cooper S and John Cooper Works. DETROIT -- After a minute-long countdown and roller-coaster screen simulation, the 2012 Mini Roadster rolled out for its worldwide debut at the Detroit auto show. "The Roadster was designed with adventure in mind," said Mini executive Ian Robertson. The Roadster, the sixth nameplate in the Mini lineup, will come in three different variants, including the Cooper, Cooper S and John Cooper Works. Robertson said 2011 was the best year ever for the BMW brand, with sales increases worldwide. Sales in the United States rose 26 percent to 57,511. Robertson said the company plans to add 15 dealers in the United States over the next couple of years, adding to the already 110 Mini dealers nationally. The Roadster debuted as a concept at the Detroit auto show two years ago. It will be produced at the company's plant in Oxford, England, and go on sale in February.